"At least Dukakis looked like he was having fun in the tank"
Readers here should know I'm no big fan of President Obama's politics and ideas. At the same time, I feel for the guy sometimes. Hurricane Irene was sold as this gargantuan doom that was going to obliterate the east coast, then it petered out to the weakest possible hurricane in short order and faded away to just a mean storm. 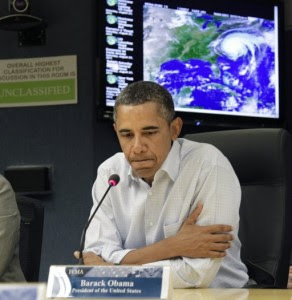 President Obama, eager to stay on top of the problem and differentiate himself from President Bush, preemptively declared a state of emergency in several eastern seaboard states before the hurricane even reached Florida. He created a special storm response office and had pictures taken of himself at the desk looking busy and important. See, I'm proactive, I'm a leader! Now people are wondering if this isn't President Obama's Dukakis-in-a-tank moment. I've noticed in my own life and watching sports that sometimes it seems like people get into ruts where everything they do just turns out wrong. They just can't get a break, and you feel bad for them. If I recall correctly, the same thing happened with the G.W.H. Bush administration where they couldn't get a break. Then again, the problems also got a lot more press.